All profits fund Alzheimer's research! My quilt, "Memories", was selected from hundreds of quilts donated to the Alzheimer's Art Quilt Initiative to be auctioned during the month of April. These are online auctions to raise money to fight Alzheimer's. Now is your chance to own one of my quilts. 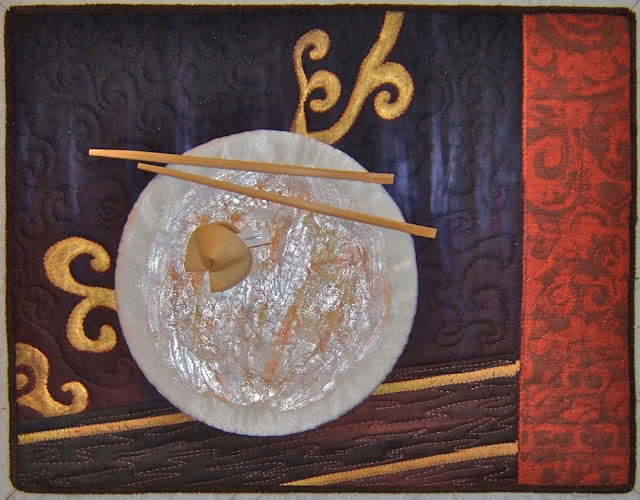 Please bid in the Alzheimer's Art Quilt Initiative online auction. Even if you don't make the winning bid, your support would make a big difference to me and to the AAQI, a nonprofit national charity that I support. Click here to bid. There are also a lot of quilts that are priced to sell at any time. 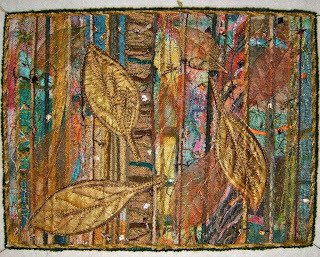 The "Falling Leaves" postcard that I donated has already sold. The larger piece pictured here is still up for sale. 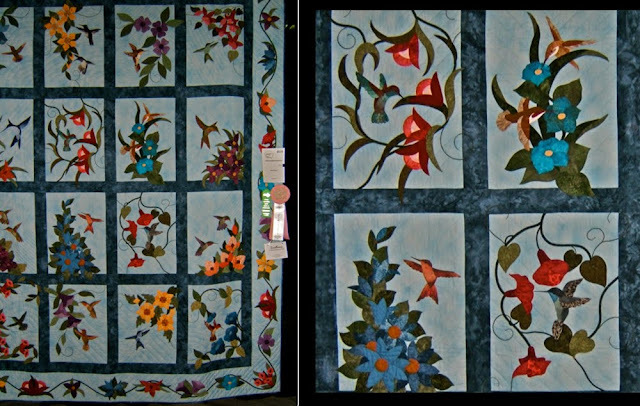 Go the "Quilts for Sale" page to see it and the others that can be purchased at all times. Two events that I'm involved in have "reveals" online today. 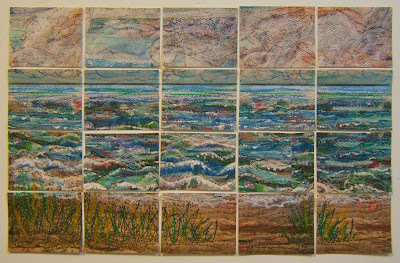 The quilts for April's The Alzheimer's Art Quilt Initiative auction are posted and one of my scrappy postcards, "Memories", is up for bidding. 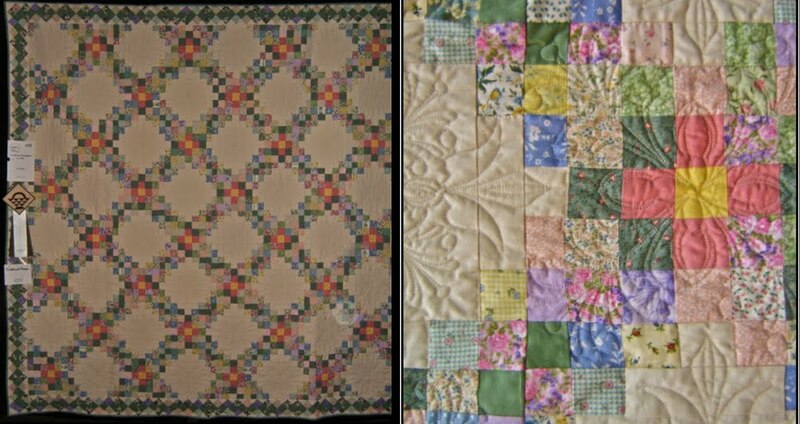 Click on the highlighted link to see all 25 wonderful quilts and then make a bid beginning April 1st on your favorite. The purpose of the auction is to raise awareness and fund research. AAQI is a national, grassroots charity. 2010 is its third year as a nonprofit corporation. So far this year it has earned approximately $7,895.38 in profit. All profit is used to fund Alzheimer's research. More about this postcard can be read about here. 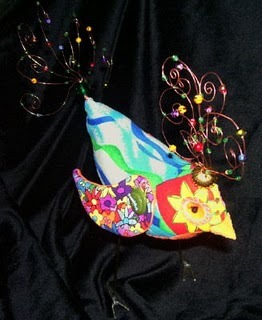 The other two pieces that I created and donated at the same time are listed for sale on the AAQI website at this link. "Falling Leaves" (#4936) is postcard size while "Fading Memories II" (4937) is 10"x 8". They, too, can be read about on the same post as the flower piece that's up for auction. On the Interpret This blog the reveals begin for the interpretations of this March challenge photo submitted by Kay of Out of the Basement. Kay and Kim are the first to post their interpretations. There will be two reveals a day through next Wednesday, the 31st. Mine will be at noon on Tuesday. 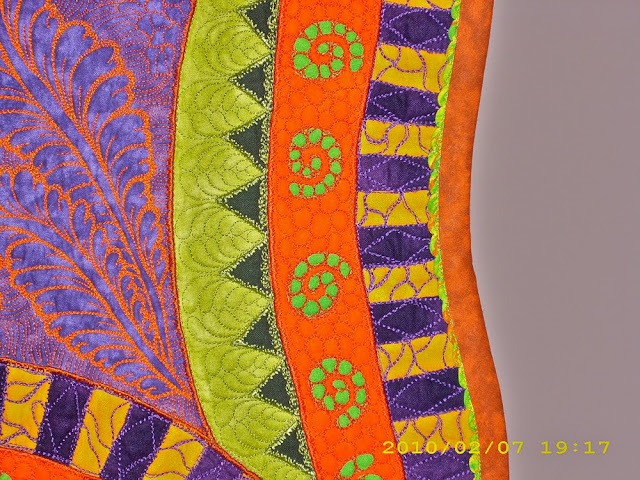 Leona's scalloped binding insert at the outside edge of her quilt, "Serengeti at Twilight", has gotten a lot of attention. She sent a detail photo and a statement to share with you. I've attached a photo of the binding for you, since you mentioned it. As I was taking questions at the show, people asked about it and thought it was rick-rack; they weren't sure if they believed me that I had made it myself. I learned the technique from a Ricky Tims CD. I surfed the web to find more specific info about Ricky Tim's process and found an interview he gave Barbara Beck for The Alliance for American Quilts in the year 2000 at International Quilt Festival. This is a scalloped binding and it looks like the scallop is a fold that's put on the quilt and then the binding is put on. In actuality the scallop is put onto the binding and the binding is put onto the quilt and I quilt in the ditch between the scallop and the binding. There's a line of stitching you can barely see running right along the edge of that quilt so there's not a single hand stitch anywhere on this. I did a bit of experimenting with the help of Leona's and Ricky's information and recognized this scallop as a technique that I've previously used in heirloom sewing ... both by hand and by machine. The "blind hem stitch" on the sewing machine does the trick. It's a matter of playing around to find the right thread, stitch width, and tension to achieve a good scallop for the fabric used. 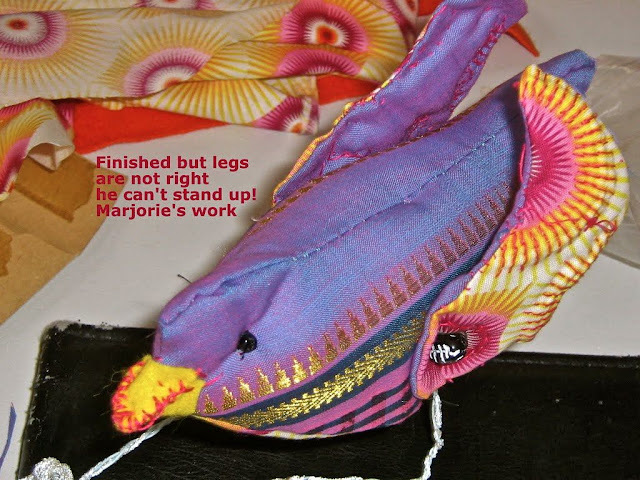 I located the stitch information for a scallop on a doll's dress I had made of batiste. The tension on the machine was set at 8.5 ... it would need to be higher for a heavier fabric. Of course, that scallop could be stitched by hand on a narrow binding already inserted into a quilt. I cannot imagine how long it would take, but it's the kind of thing Linda Roy wouldn't think twice about doing ... if she hasn't already. PS: Here's a bit more information in response to the questions in the comment section. The scallops are made on the binding by machine sewing the blind-hem stitch on the folded edge. Then the binding is attached to the desired place on the quilt by sewing over the row of machine machine stitching on the binding. A regular binding for the raw outside edge would then be added. At least that is how I would do it. I don't know if that's the procedure followed by Ricky Tim. And yes, Kay, that is the same machine stitch used to make a lettuce edging on knits. The trick is to get the tension for that one stitch that swings out over the edge of the fold tight enough to draw the fold into the stitching line. If this scalloped piping were being done by hand the procedure is quite different. It would be done after a plain fold piping is already sewn into the quilt. Click here to go to a link to show how that would be done. 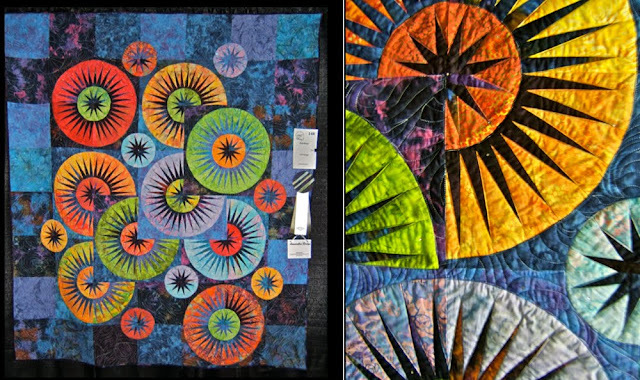 Leona posted a tutorial here on how she made the scallops and applied them to the binding of the quilt. The Smoky Mountain Quilt Guild Show took place in Maryville, Tennessee last week. 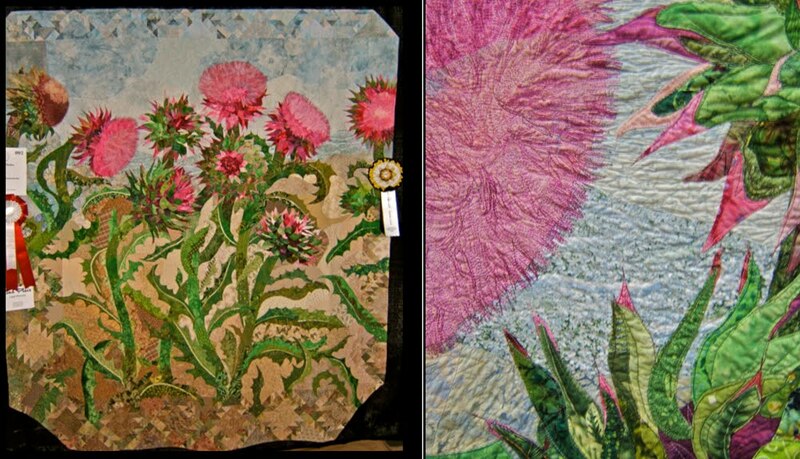 There were over 1650 visitors who came to see the exhibit of 175 quilts. The submissions were mostly from Tennessee quilters. Forty-five quilts were sent from 17 other states. 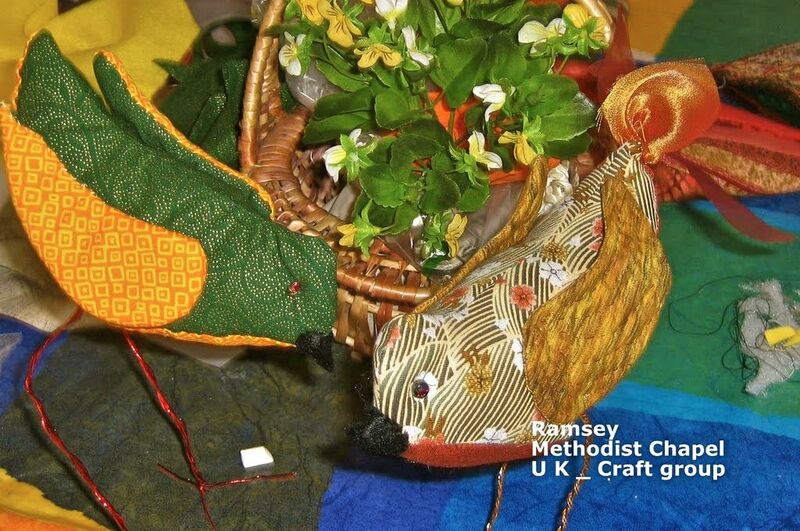 All the quilts can be viewed in a slide show here on the guild's website. 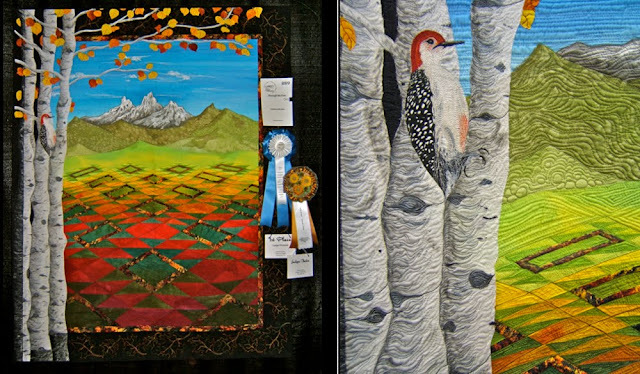 I'd like to share the quilts that won the special award ribbons (click to see post about ribbons) since I was in charge of those. The person's name who created the ribbon's rosette is in parenthesis behind the award title. 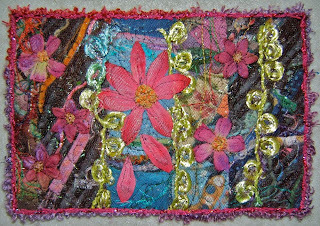 Linda was inspired by antique button (1850-1880) found on bracelets and watches purchased at "Prized Possessions" at national quilt shows. She placed motifs on a background of burnt cheddar. The grays and gold/yellow mimic the colors found in many of the buttons. 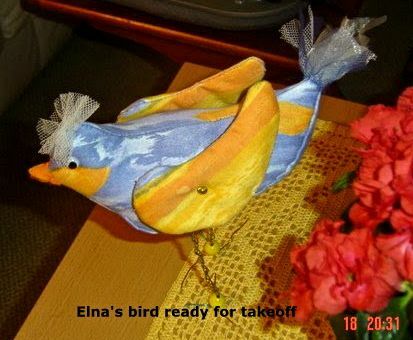 Linda is well known for her hand-work and quilting. Leona wrote, "Medallion style using orange, purples, greens, and gold. The quilting motifs are from a study of the Serengeti region. No piecing - all is raw edge applique." Leona does amazingly intricate quilting designs with her Tin Lizzy long arm machine. I wish I had taken a close-up photo of the scalloped narrow piping that was inserted at the edge of the border. Mary says, "This is my first large applique project. 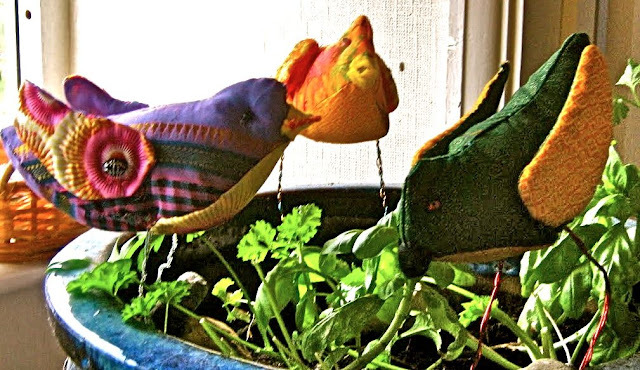 It consists of 16 blocks with each one having a different flower and hummingbird in place. The piecing was all done by machine; there is hand and machine applique in each of the blocks." Peggy writes, "My version of the pattern added trapunto and I changed the border. 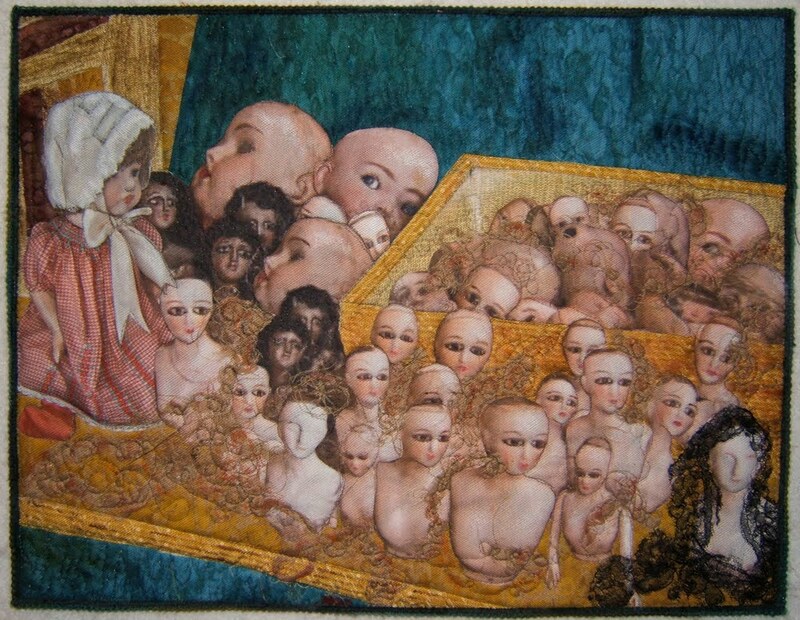 The hand-guided machine quilting by Kathy Drew used over 6,000 yards of thread." 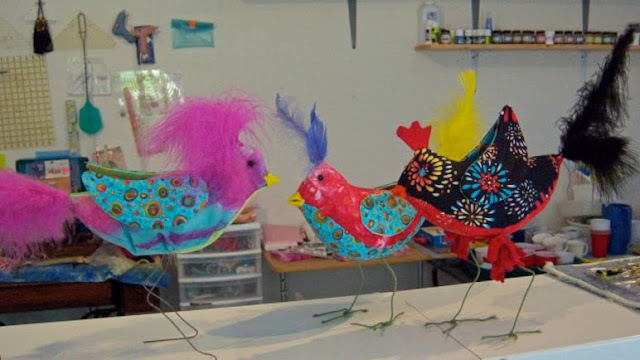 Lissie wrote, "Tennessee Quilt Shop of Jonesborough invited Judy Neimeyer to teach a 3-day class using a technique called Foundation Paper Piecing. Curved piecing and traditional skills are required to jin the units after the foundation piecing is completed. The design and color are unique. The crystals add to the beauty of the quilt. 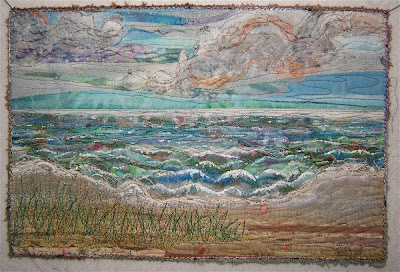 It is quilted by Donna Patrick." 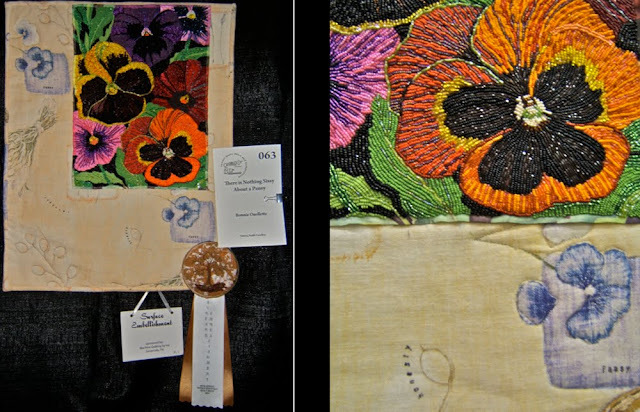 "There Is Nothing Sissy About A Pansy"
Bonnie wrote, " My attraction to the pansy and its strength through tough winters, stimulated me to design this piece. The background fabric is from a thrift store dress and is machine quilted. The superimposed beaded piece is done completely by hand." "Games And Toys For Girls And Boys"
This quilt was made for the Norris Guild Challenge entitled, "The Child Within". It was made by Dot and quilted by Loretta Painter. Geraldine wrote, " Several years ago I took a class taught by Mary Mashuta. 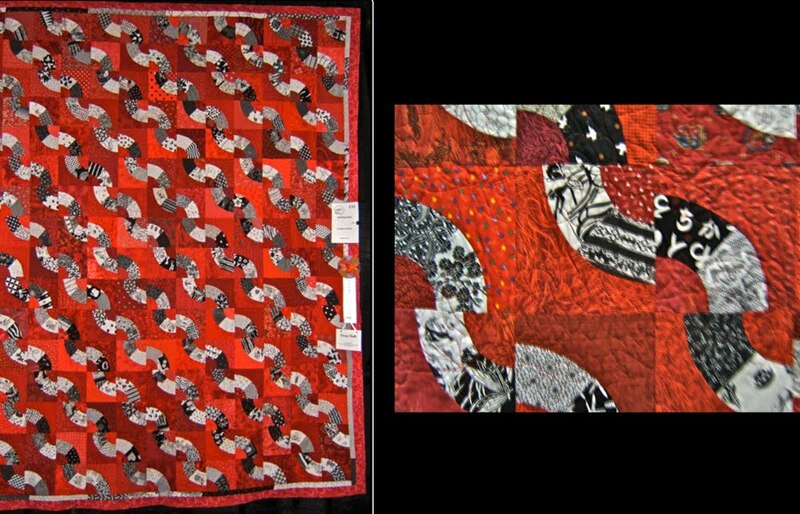 Using her book, Cotton Candy, I decided to use black and white fabrics with a red background to make the quilt POP. 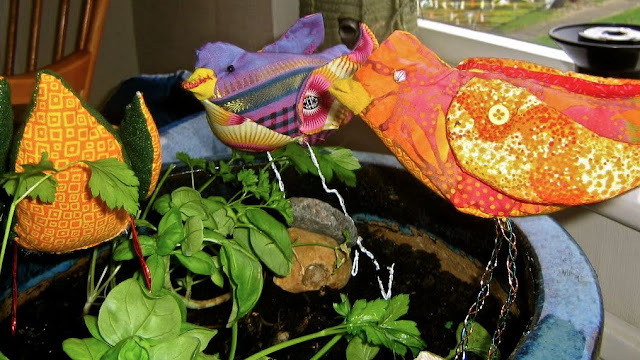 The construction was completed in November 2009 and is quilted by Sue Drinnen." 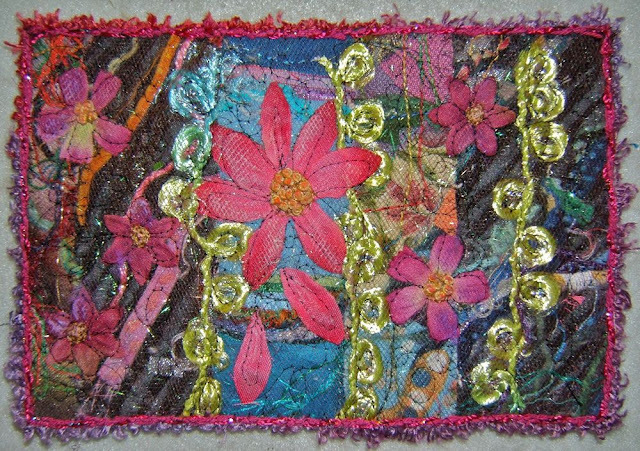 "A Walk In A Springtime Garden"
Ann wrote, "I loved the picture of the Irish Chain quilt on the cover of the quilt book, Using Your Scraps. 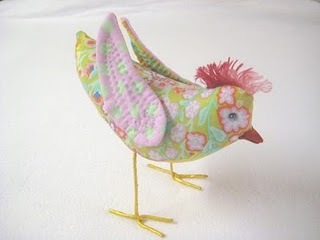 I used many pastel scraps that had been saved for many years plus a few purchased fat quarters. It's machine quilted by Debbie Best." Leslie wrote, "While pondering what to do for the Pearls of Wisdom SMQ Challenge for the 30th anniversary, Doyleen Taylor said she remembers sitting under her grandmother's quilt frame. And so the idea --on the left side is 1980, on the right is 2010 with the little girl grown up." 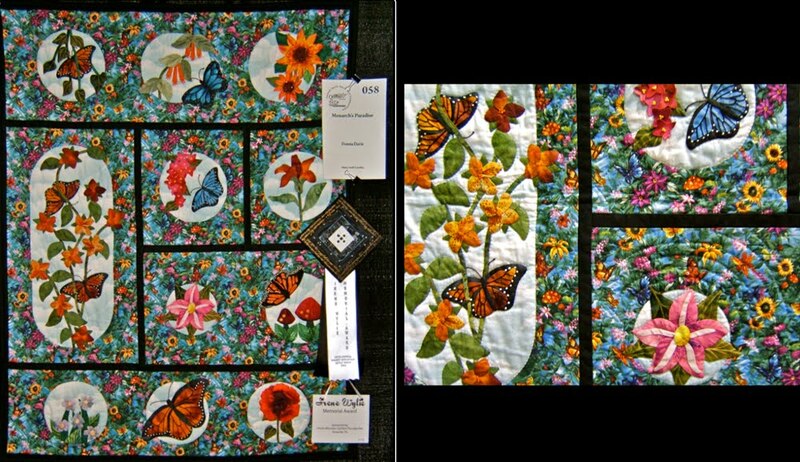 Donna wrote, "I made this quilt for the Hoffman Challenge in 2007. The background fabric was the challenge fabric and as it turned out, was a real challenge for me. It won Creator's Choice. I made some flowers by using the Petal Play technique." 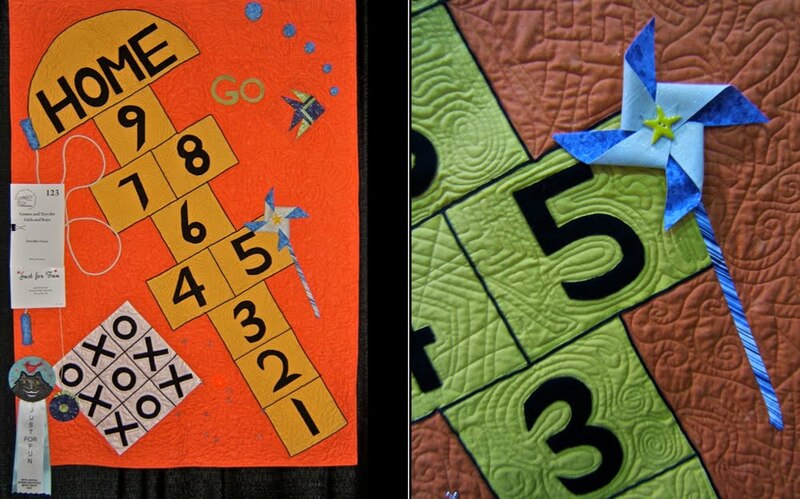 Christine wrote, " This was a challenge quilt. 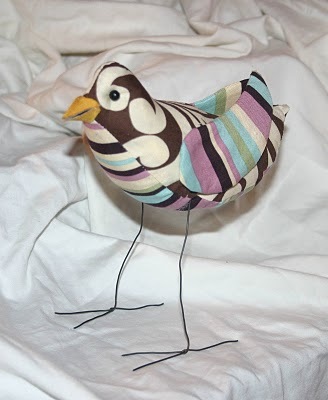 Most of the fabric was hand dyed or painted. It's pieced by machine. 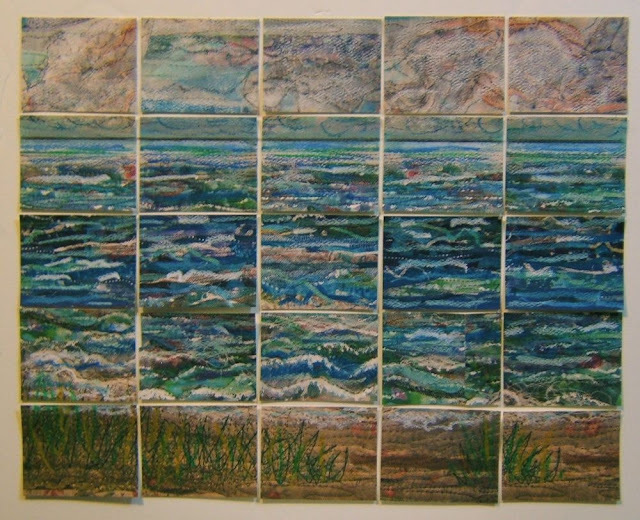 The design was inspired by Quiltscapes written by Rebecca Barker. Mary wrote, "This is an original design based on my photos of wild thistles growing along the roadside during a hot summer drought. The brilliant green, pink, and fuchsia colors were an inspiring contrast to the parched summer fields." That one got my vote ... along with a whole lot of other people's. The prep work of tearing old army blankets from World War II that had been at the family cottage "forever" into "batting" for the twenty-five panels was done the other night. Fabric backings were also torn to size and ironed. 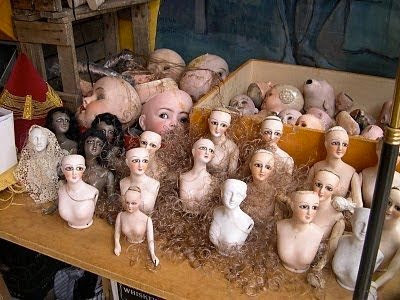 The fabrics were those that had been passed on to me. 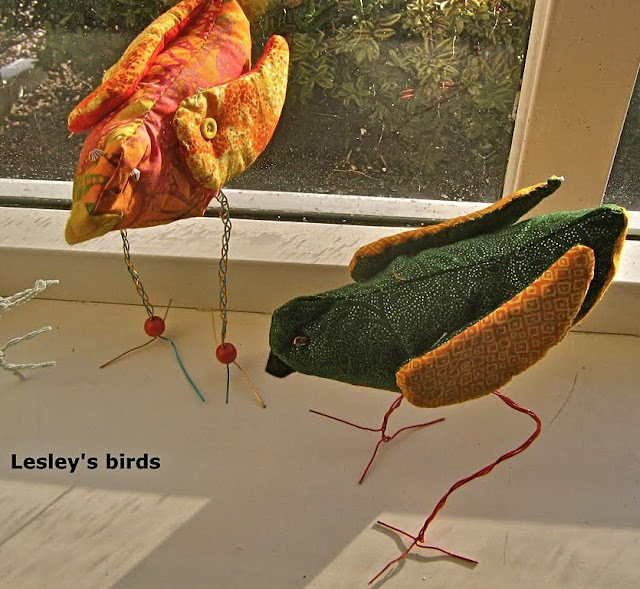 The blue one had been two lengths sewn together for a make-shift table covering by somebody. The stains and faded areas won't ever be seen because the backing for these panels will get sandwiched between the top and yet another piece of fabric that will be stapled into the foundation frame. The first two panels were laid out at the same time so that lines, shapes , and colors flow from one to the other. The panel on the left is already quilted while the one on the right is pinned. It's since been quilted and I'm about to lay out a third panel for the horizon row yet tonight. Quite a lot of yarn has come to me from the collection of a friend who was a weaver. I'm pleased to feature them ... and Elvis who will make an appearance in every panel. His image is being taken from the chiffon scarf that can be seen at the left in the top of the above photo. Elvis is quite obvious at this point. He'll blend in a lot more later on when I get to the point of shading, emphasizing, and obscuring with the oil stick pastels. This installation piece will progress a lot more quickly than did "Prairie Performance". 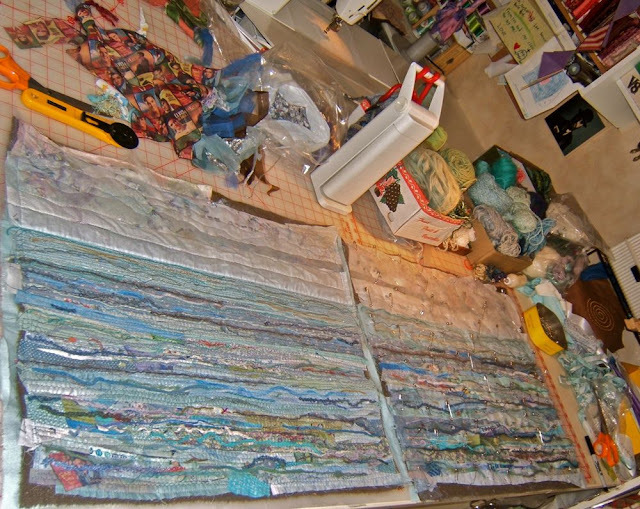 There are three levels of work ... laying out the composition, the first round of quilting which is part of the design, and then the second round of more spare quilting that attaches the panel to the mounting fabric. The prairie flower panels had seven layers of work. I've had mixed feelings about this "clean" plate. There have been moments when I've looked forward to scrapping this piece that was created to meet last months challenge for "Interpret This" and using the "good" parts for something else. Now that there's a fortune cookie on it, I LOVE IT! After all, a clean plate deserves a treat. Doesn't it? I saw a fortune cookie made from fabric online sometime ago. 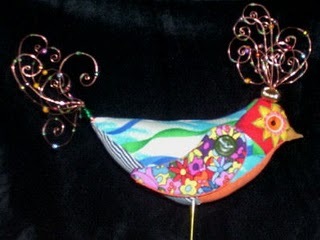 At that time I made one up thinking that I'd make more as funky presents for friends. It had crossed my mind to have one in this piece. However, I misplaced it and had not bookmarked that site. The deadline came for the "Interpret This" challenge piece and I had run out of time to look any further in my studio or online. 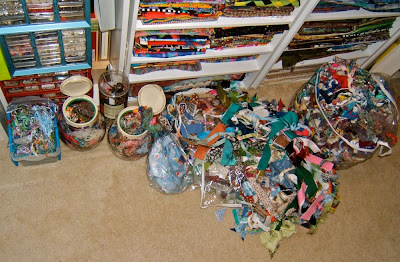 I've been spring cleaning in my studio and found the baggie with the supplies I had gathered to make Christmas fortune cookies plus the completed one. I made up another with the perfect fabric that makes it look real. Woo Hoo! Now the piece is complete. I'd like to share with you how I made the cookie. Cut a piece of fabric large enough for two circles. Fuse a light-weight stabilizer to it. 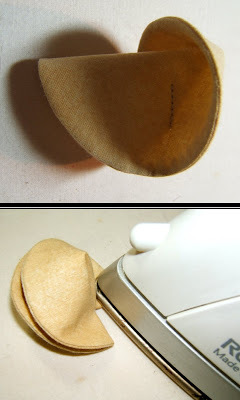 Draw one circle on the wrong side, or stabilized side, of the fabric. Fold the fabric in half with right sides together. Machine stitch around the complete circle. I shortened the stitch to 2.0 on my Pfaff. 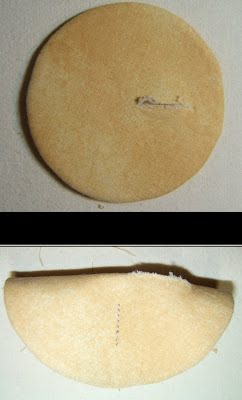 Trim away the excess fabric close to the circle with pinking shears. Make a 3/4" long slit through the stabilizer and one layer of fabric. Use tweezers to turn the circle right side out. Press the circle with an iron to smooth the outside edge. Fold in half with right sides together. 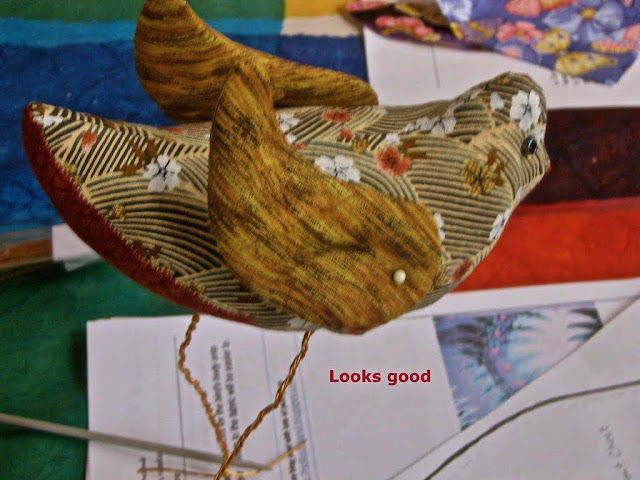 Sew a line of stitching as shown. Flip, or fold back, each side to the center to form a fortune cookie. 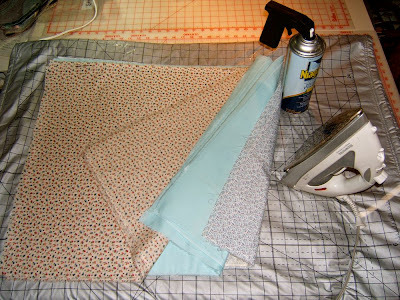 Press a crease on each side with an iron. Write a fortune on a strip of paper and slip it inside. Mine says, "Be direct. Usually one can accomplish more that way." 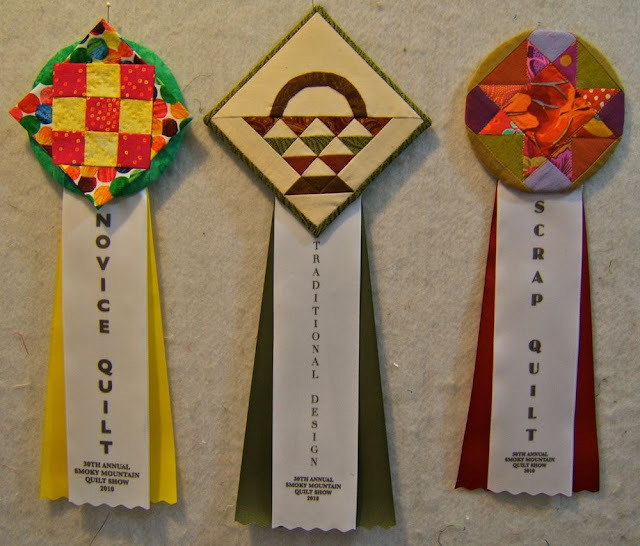 This year I was in charge of the Special Award Ribbons for the Smoky Mountain Quilt Guild's 30th annual show that begins Friday, the 19th and runs through the weekend in Maryville, Tennessee. 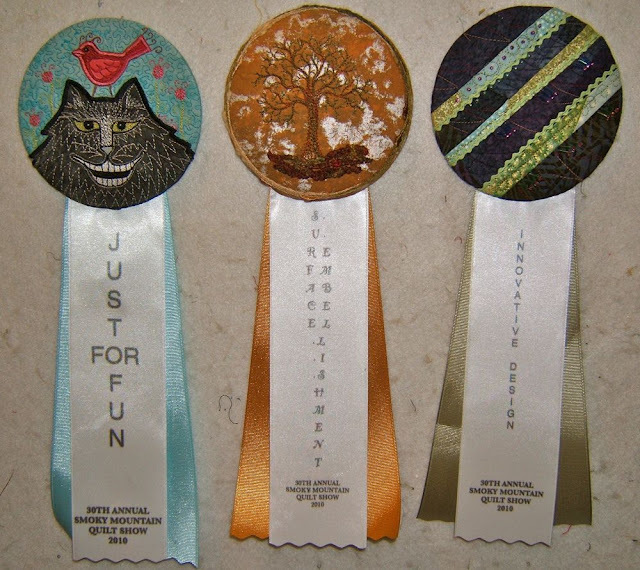 Previously, I had designed and made all these award ribbons for our 2007 and 08 shows. 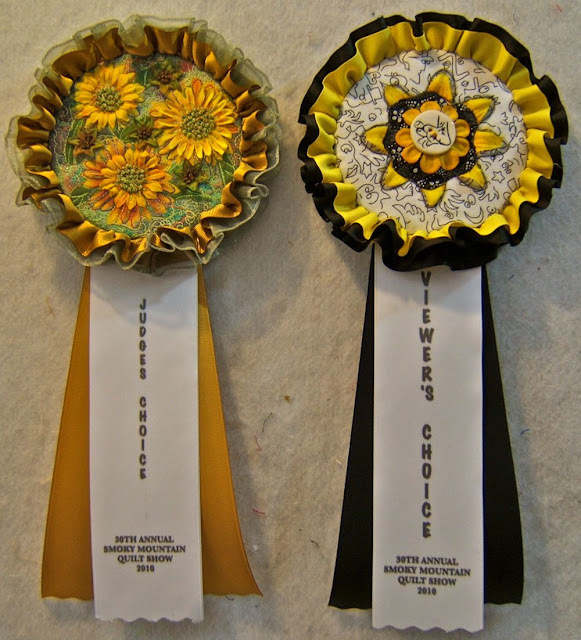 This year I invited other talented members in our guild to help by designing rosettes for nine of the thirteen awards that I constructed for this year's show. Sheila Rauen created the "Just For Fun" rosette with applique and machine embroidery. Bridgette Matlock machine embroidered and painted the "Surface Embellishment" award. While Tone Haugen-Cogburn created the rosette for the "Innovative Design" award. 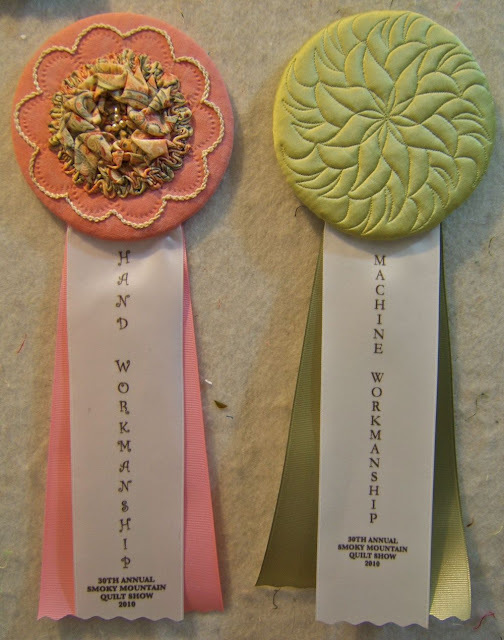 Linda Roy designed and hand-stitched the "Hand Workmanship" rosette and Loretta Painter designed and machine stitched the one for "Machine Workmanship". 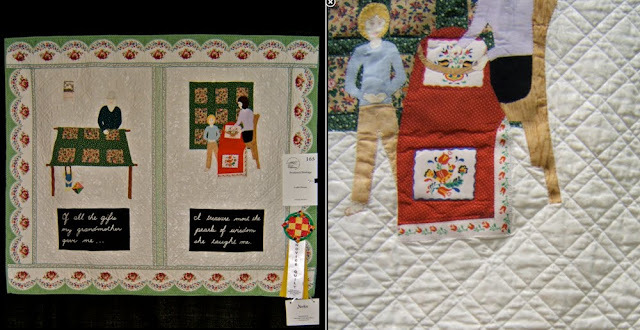 Patty Ashworth designed and hand-quilted the "Novice Quilt" award that goes to a first made quilt among all the entries in the show. Gloria Felter made a basket block for the "Traditional Design" award. Melissa Carter designed and stitched the rosette for the "Scrap Quilt" award. This year a special award is given in honor of our long-time guild member, Irene Wylie, who passed away recently. The rosette was designed and made by Tone Haugen-Cogburn. Our Thursday Bee sponsored the award money for this one. I designed and stitched four rosettes. There are flower petals both under and on top of tulle netting in those that have blossoms. These two for the "Judge's Choice" and the "Viewer's Choice" awards. And these for the "Best of Show" bed quilt and wall quilt. There are instructions for how I made these ribbons here where they can be downloaded to your computer as a PDF file and printed out. A major thing that I now do differently is to print directly on the satin ribbon rather than onto a "T-shirt Transfer" that got ironed on. I also fuse two layers of the satin ribbon together before constructing the award ribbon. 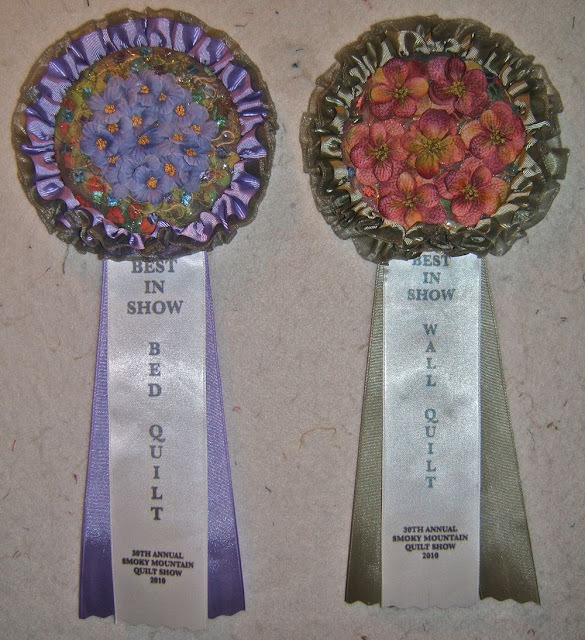 To see photos of the SMQ Show special award ribbons I've made in previous years go here for 2007 and here for 2008.